Think getting your house decorated for Christmas is stressful? Imagine the work required to transform the 26 ships in the Carnival Cruise Line fleet into holiday showcases. 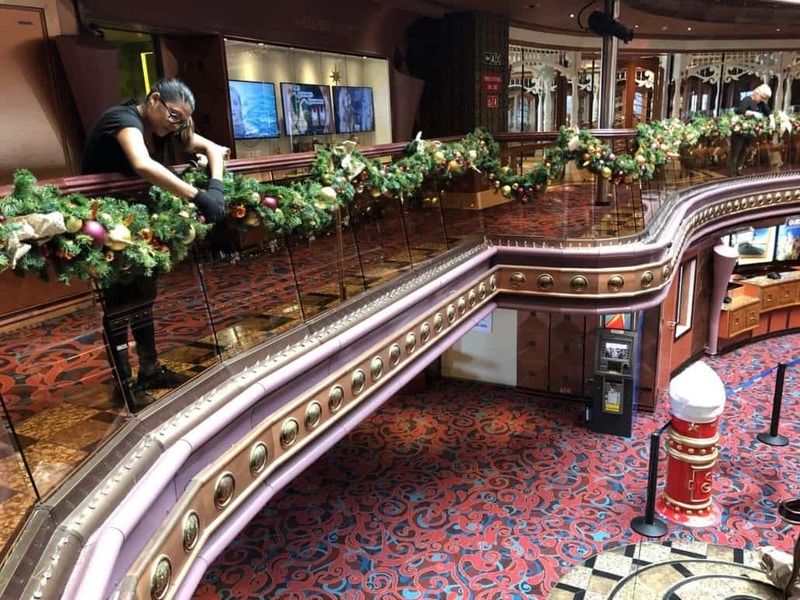 During a recent visit to the Carnival Elation, I got a first-hand look at what it takes to deck the halls of a single vessel… as well as the scoop on just how epic a project this is when you take the entire fleet into consideration. Decorating doesn’t just go on in the public spaces accessible to passengers. After all, the crew will be on board during the holiday season, too. So when it comes time to decorate the Carnival Elation, there are more than 20 trees placed around the ship (which, if stacked end-to-end, would tower over 200 feet!). Then there are 30,000 lights, 6,000 feet of ribbon and around 250 hand-tied bows. And remember, that’s just for one ship. Of course, the biggest and best tree on the ship is found in the main atrium… which also happens to be where many of the holiday-themed activities take place. The whole process starts long before the first ornament is placed on the first tree, though. Right around the time when most people are compiling their Thanksgiving menus, the folks at McGowen Creative Group begin transporting literally tons of Christmas decorations to the port. Then, once the ship has cleared customs, a team of up to 15 folks (whom we’ll call “elves”) swarms the ship once guests have disembarked… and the magic begins. Much of the holiday magic — including a mailbox which is directly linked to Santa’s workshop at the North Pole — takes place in the main atrium. It’s an incredible process to watch because there’s a lot to be done and only a few hours in which to accomplish the transformation. Before long, the garland was hanging from railings, a two-story tree was perfectly positioned, and there was even a mailbox in which kids of all ages could drop their letters to Santa. If you, like a lot of people, have been dreaming of a white Christmas and fear that something might get lost in the translation of cruising in a warm climate, fear not. Even in the Caribbean, the Carnival elves manage to figure out a way to make it snow in the atrium. Carnival’s Christmas elves put the finishing touches on a tree that will sit in one of the Carnival Elation’s main dining rooms. So, if it takes more than 20 trees to decorate one ship, what does it take to make all of the Carnival ships holiday ready? Over 568 trees which, if stacked on top of one another, would reach nearly a mile high! Over 750,000 lights which, if strung together, would stretch about 50 miles. Of course, the tree that most people will remember from any given ship is the one gracing the lobby. These are not only the largest on board, but they also feature lights that are synchronized to the music. And Santa isn’t the only one who visits the ships during holiday sailings, because you know The Grinch wouldn’t let the guy in the red suit have all the fun.